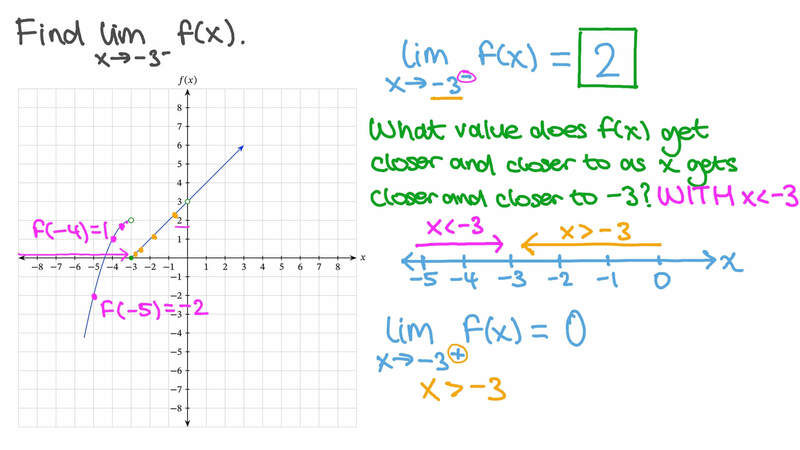 In this lesson, we will learn how to find the values of one-sided limits for piecewise-defined functions both graphically and algebraically. Find l i m  →    𝑓 ( 𝑥 ) . Determine l i m 𝑥 → − 4 − 𝑓 ( 𝑥 ) , if it exists. Determine 𝑓 ( 0 ) + . Determine l i m 𝑥 → − 6 − 𝑓 ( 𝑥 ) , if it exists. AThe limit does not exist. Use the graph below to find l i m 𝑥 → 8 + 𝑓 ( 𝑥 ) . Use the graph below to find l i m 𝑥 → 5 + 𝑓 ( 𝑥 ) . Determine l i m 𝑥 → 0 + 𝑓 ( 𝑥 ) , if it exists. Determine l i m l i m l i m 𝑥 → − 5 𝑥 → − 7 𝑥 → 0 𝑓 ( 𝑥 ) + 𝑓 ( 𝑥 ) + 𝑓 ( 𝑥 ) + − . Determine 𝑓 ( 1 ) − . Determine 𝑓 ( 0 ) − . Using the graph shown, find 𝑓 ( − 3 ) + . Determine l i m 𝑥 → 8 − 𝑓 ( 𝑥 ) . Determine l i m 𝑥 → 1 + 𝑓 ( 𝑥 ) . Determine l i m 𝑥 → − 3 − 𝑓 ( 𝑥 ) . Determine 𝑓 ( − 3 ) − . Determine l i m 𝑥 → − 6 + 𝑓 ( 𝑥 ) .